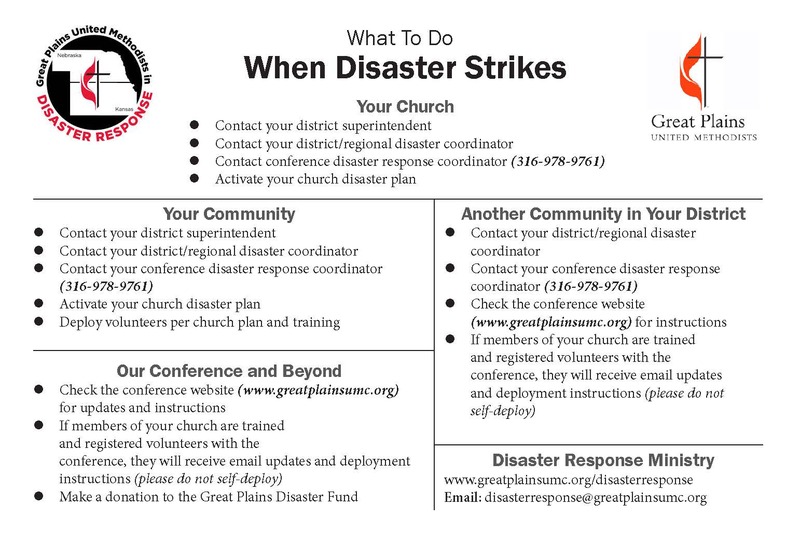 The Great Plains Conference has adopted a Disaster Response Plan for responding to disasters within the bounds of the Great Plains. Click to view the plan. Because of the size of the geography of the Great Plains Conference, the geography will be split into regions. Click to view the regional map. The Great Plains Disaster Response Committee recommends local churches develop plans for disaster response. View a sample plan. Disaster Response Handbooks are available for district superintendents, church pastors and local churches, as well as for district disaster response leaders and regional disaster response leaders. If you would like more information, or if your congregation is interested in disaster response training opportunities, contact the Rev. Hollie Tapley, disaster response coordinator at 785-414-4227 or htapley@greatplainsumc.org.